- Held over 3 weeks, with an exclusive ranking for each week. - The ranking counter will be reset at the end of each week, so you will have to restart from 0. - The first 2 weeks are based on subjugation counts. 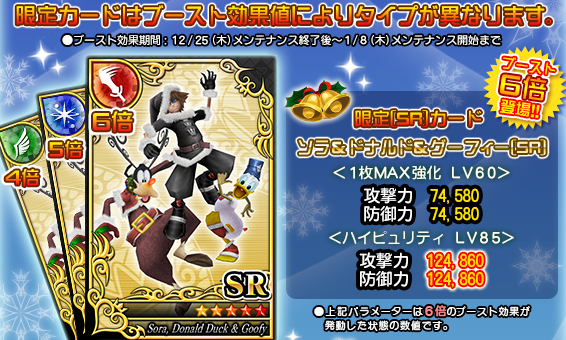 - The third week is based on the Christmas Ornament drops obtained from the event Heartless. 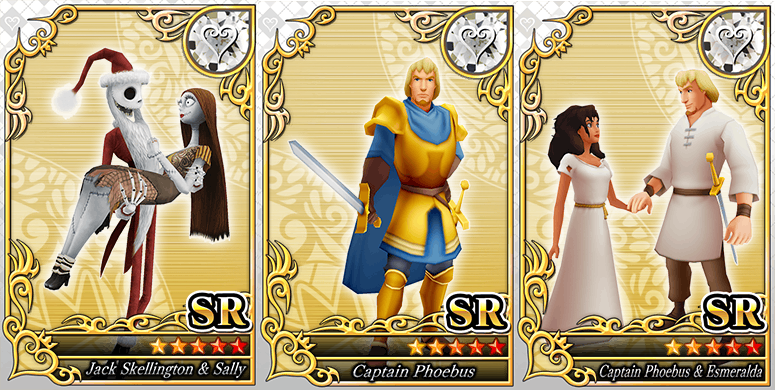 - For all rankings, you will have to at least defeat 1 or obtain 1 drop, to be valid for the rewards. As a celebratory gift for this event, all players will be rewarded with 30 Potions when they log in between 4th till 25th December. Also, there will be exclusive daily log-in rewards as well! From 18th December till 25th December, Christmas Boxes will be scattered throughout the world for you to find! 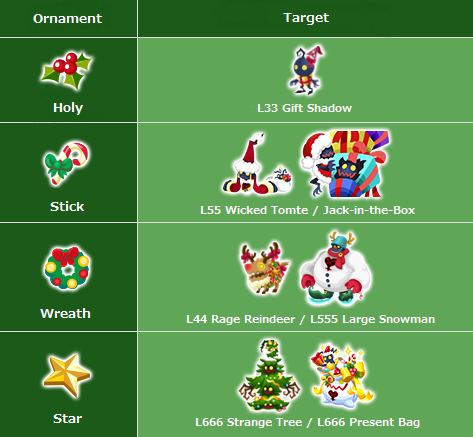 Note 1: The Ornaments inside the Christmas Boxes are fixed, and is unaffected by the Ornament Boost ability. Note 2: It costs 1 AP to open a regular Christmas Box, 5 AP to open a rare Christmas Box. Once opened, you have to wait 24 hours for them to respawn. 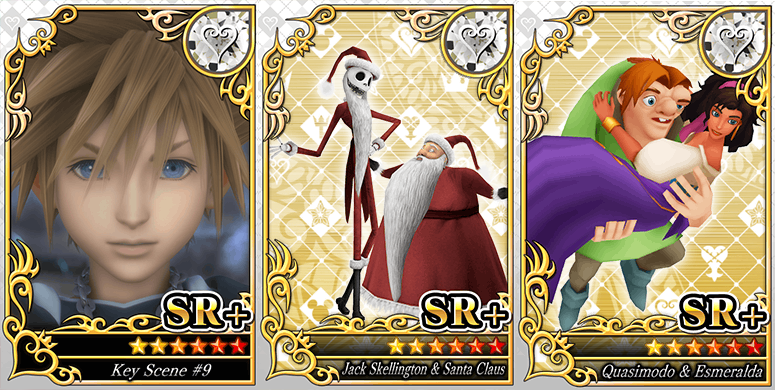 Note 3: Inside can contain either SR+ Yen Sid, SR+ Sora: Wisdom Form, Potions, Ornaments, or Christmas Tickets. *You can obtain it by killing a total of 150 Heartless throughout this period. Any Heartless will do. *Ultimising a card does not affect the bonus damage rate. 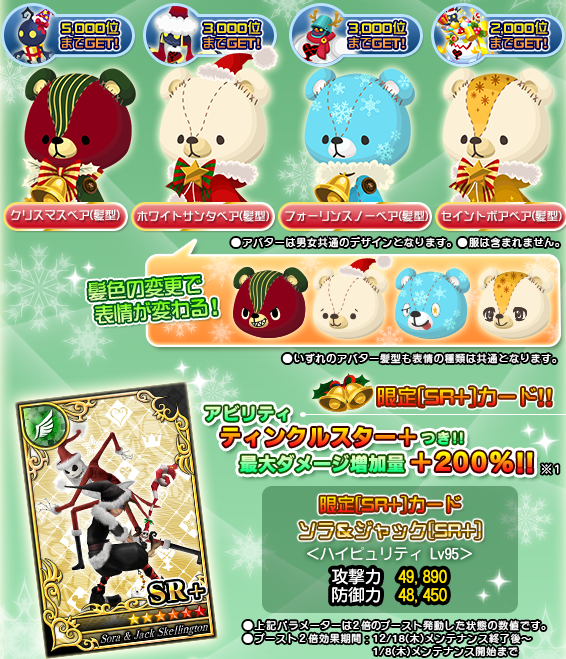 After the maintenance on 11th December till the maintenance on 25th December, you are able to obtain Christmas Tickets. By the end of this event, you can earn exclusive rewards based on the total amount of tickets you have accumulated. 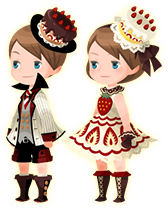 Also after next week's maintenance, there will be a chance to earn lots of tickets! 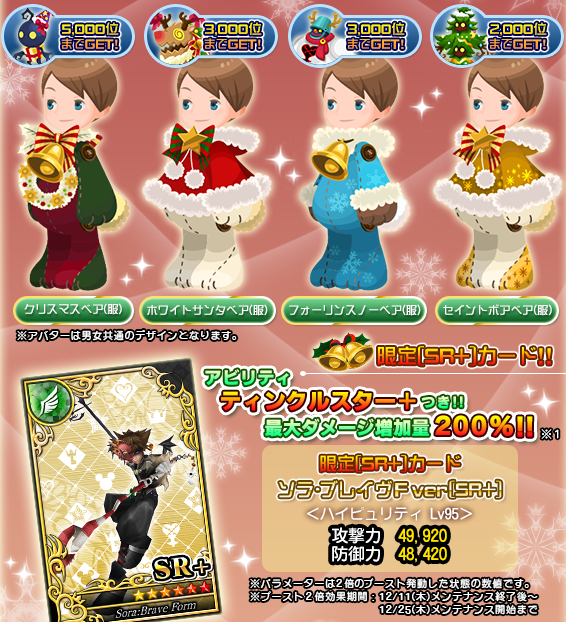 After the maintenance on 18th December till the maintenance on 28th December, you are able to use the ornaments you have collected to participate in the event draws. There are 3 categories for the event draw, each with its own list of rewards. These draws can be accessed in the second tab in the Event screen. Note 1: Spending your ornaments in the draw will not affect your ranking. Note 2: You can choose to draw individually, or consecutively. The chance of you obtaining certain rewards will remain the same regardless. Note 3: You will receive a random reward from the list below when you draw. Ooooh, I like the charts. 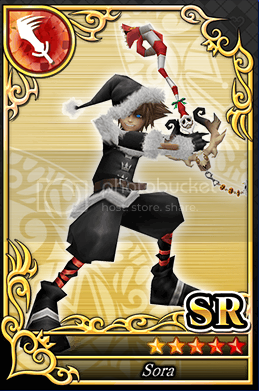 Anyone has the SR Sora from the Raise Draw? I need the image. It is not my card so its not HP'ed. 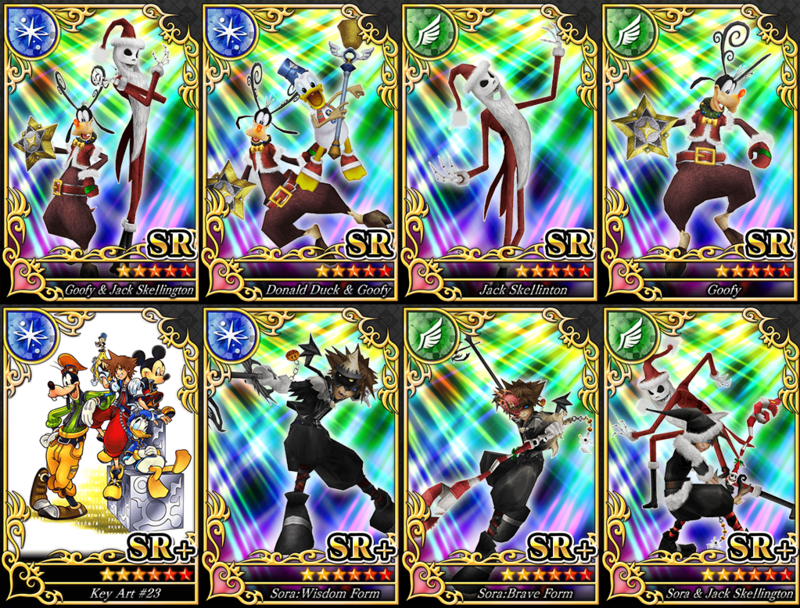 The stats for HP SR+ Sora Wisdom Form and HP SR Donald and Goofy are missing. The latter's stats are 15301/11846 --> 22952/17769. 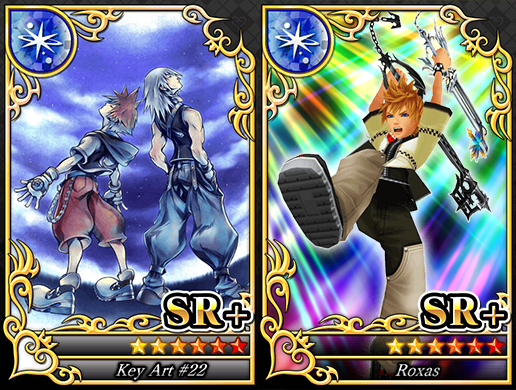 Idk what Sora's are. Oh yeah haha. I have them already, but forgotten to update. Thanks! All Heartless locations are fully updated. Ranking reward + christmas ticket list has been updated as well. high chance comes from Raid boss (Sub one).. other than that probably from mission. I will be away for the entire weekend for Jump Festa, so if there are any enquiry on this event please ask me by today. Probably Country of the Musketeers,right? Your hope is rewarded. That's exactly what we got.